These days there is a concerning trend for pastors to scold those of you who care about contending for the faith once delivered to the saints, almost as though you are being a “Pharisee” for daring to love the Scriptures that were breathed out by the Holy Spirit. The current apostasy just continues to grow; spiritual blindness becomes darker, and mainstream evangelicalism has largely rejected sola Scriptura in favor of its infatuation with Contemplative Spirituality/Mysticism (CSM). Sadly, this all began with evangelicalism’s spiritual adultery with the sinfully ecumenical Emerging Church aka Emergent Church, which had CSM as a core doctrine and has contributed mightily to its postmodern form of liberalism that the EC refers to as Emergence Christianity. And so we’ve now reached the exact same place in the visible church as that once encountered by Charles Haddon Spurgeon in the Baptist Union with the encroaching liberals of his day. However, what seems to be largely forgotten today within the Christian community is the command that the pastor-teacher must hold firm to the trustworthy word as taught, so that he may be able to give instruction in sound doctrine and also to rebuke those who contradict it (Titus 1:9). Jesus’ words to Peter were not only very severe, they were deliberately spoken in the presence of the other disciples (“Jesus turned and looked at his disciples”). They probably shared Peter’s views and needed the rebuke, too. The severity of the rebuke arises from Jesus’ recognition in Peter’s attempt to dissuade him from going to the Cross the same temptation he had experienced from Satan at the outset of his ministry. Satan offered him the option of using the world’s means of accomplishing his mission (cf. Matt 4:8-10). And I do wish you to know that I fully understand there are many who ignore my warnings—as well as those of other online apologetics and discernment ministries—considering us some kind of warped “ODMs.” But, at the same time, I offer that it might not be wise to so easily dismiss what some of us are saying. O, without a doubt, the accepted way of writing today is to do a kind of “plus-minus” assessment of a given subject. Yet I wonder, have we really actually considered this from the Lord’s perspective; or could it rather be, simply the things of man in secular academia? Suppose I were to write an article about cancer. Would I really need to elaborate on some of the more “positive” aspects of this terminal disease; like how it so suddenly metastasizes, and just how completely dead it kills a body? As a pastor-teacher the Bible tells me there are times where I have to — charge certain persons not to teach any different doctrine (1 Timothy 1:3), contrary to proper Christian teaching. In addition, I’m also not afraid to speak the truth from God’s perspective because Jesus says — “Whoever is not with me is against me, and whoever does not gather with me scatters” (Matthew 12:30). The truth is clear; conveniently and comfortably the evangelical community has now assimilated itself into the pragmatic business methods of the world a la Rick Warren on the one hand, and on the other it’s embracing spurious CSM, which has led to quasi-Christian leaders like Rob Bell who are attempting to exploit you with false words from within the mainstream of the visible Christian community. We need to remember that when we’re shown from the Bible that these things are not in line with what God Himself would have us do, and we still choose to walk in them, then we have made a choice to put ourselves in step with Satan himself. In other words, these variant levels of compromised, aberrant, and/or heretical doctrines ultimately originate from the same rotten root. They derive from Satan and then his deceiving spirits are sent forth to manipulate men until the teachings of demons merge onto the broad way, and all who foolishly follow them will eventually arrive at the same eternal destination of destruction. Laugh if you will, but no matter how much we’d like to try and convince ourselves that God will just sort it all out in the end, the absolute fact remains that Jesus has left us here as His ambassadors (c.f. 2 Corinthians 5:20) to set the record straight. Our Lord has unambiguously told us — “As the Father has sent me, even so I am sending you” (John 20:21). Clearly then, just as it was also once a part of His job, the Master has now entrusted us to warn people who are in sin—and particularly those claiming to be within the Body of Christ—to leave that practice immediately. Sin means “to miss the mark” of Christ; and when we do miss this mark, it’s God’s Name which is sullied, and it is His church that is mocked. Just take an honest look at all of the garbage this pseudo-Christian EC has already dragged into the mainstream of the visible church today. As I close this out, for now, 1 Thessalonians 2:4 instructs ministers of the Gospel that—irrespective of prevailing opinions—and regardless of whatever culture into which our Lord sends us that — we have been approved by God to be entrusted with the gospel. Well, the time has come to realize that this isn’t a drill; to be a Christian or a pastor-teacher is not a game, and some of the saddest words in the Bible are — Demas, in love with this present world, has deserted me (2 Timothy 4:10). And how it must break our Lord’s heart today that there are far more Demas’ in the church right now than there are Pauls. 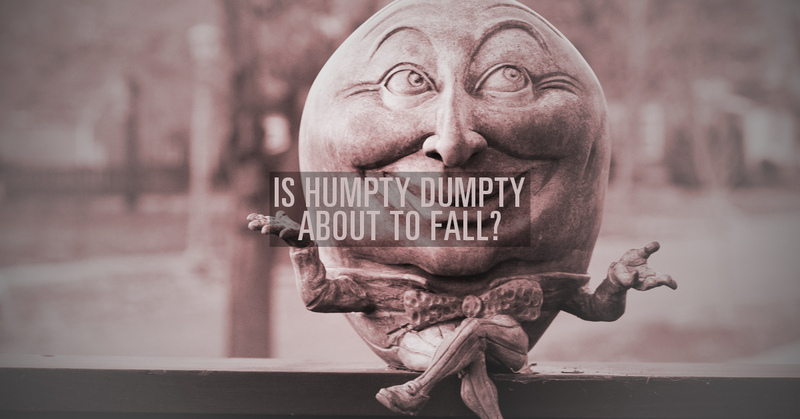 Is Humpty Dumpty About to Fall? Abortion: Can we affect change to end it?